يقع Linareva Moorea Beach Resort في منطقة مشهورة للغاية في المدينة. هذا الفندق هو من الخيارات الشائع بين المسافرين. يمكن من هنا للضيوف الاستمتاع بسهولة الوصول إلى كل ما تقدمه هذه المدينة النابضة بالحياة. يوجد العديد من المعالم السياحية الأكثر جذبًا للسياح في هذه المنطقة. يقدم Linareva Moorea Beach Resort خدمات لا غبار عليها وكل أشكال اللياقة وحسن الضيافة اللازمة لإسعاد ضيوفه. يقدم الفندق واي فاي مجاني في جميع الغرف, خدمة التنظيف يوميًا, تخزين الأمتعة, واي فاي في المناطق العامة, صف السيارات لضمان الراحة القصوى لضيوفه. استمتع بوسائل الراحة الراقية في الغرف أثناء إقامتك هنا. بعض الغرف تتضمن تلفزيون بشاشة مسطحة, بياضات, صوفا, مناشف, إغلاق لمساعدتك على استعادة طاقتك بعد يوم طويل. يقدم الفندق العديد من الفرص للاستجمام كمثل شاطئ خاص, غوص, تدليك, حديقة, رياضات مائية (غير آلية). مهما كانت أسبابك لزيارة المدينة، فإن Linareva Moorea Beach Resort هو الخيار الأفضل لإقامة مثيرة وممتعة. Best things: welcome fruit, free bicycles , beautiful decor, private beach area, jetty, kayaks. Worst things; It's very far from anywhere, so will cost $$ for taxi but it's possible to get public bus to resort but they don't have any info on timetable. Kitchen equipment is very basic but you could buy extra at the supermarket. A small bungalow resort a bit away from most other hotels and places. Local bus stops outside. We rented a neat beach front bungalow. Not fancy but great for us and it had a kitchen and nice seating areas inside and out. No nice beach, but nice dock to dive from, with friendly sharks laying around. Cool ! Free kayak and bike rental is great ! 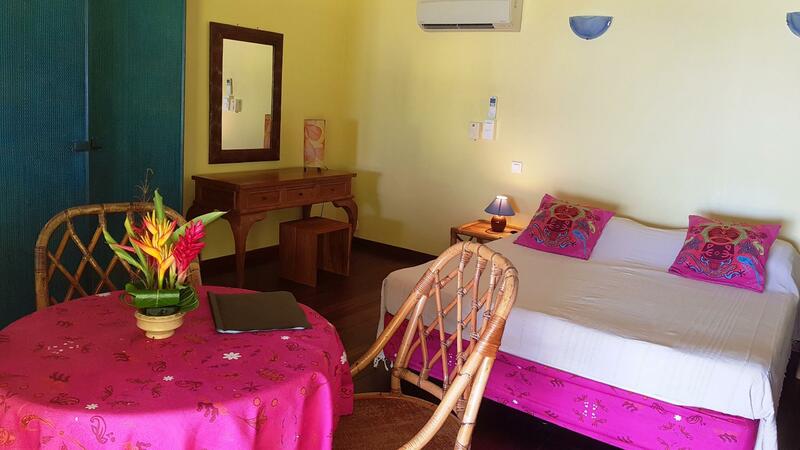 Close to nicer beaches, snorkel areas, mountain trail, small restaurants, food store. Would stay there again. The value for what you get is most excellent. We returned from a week long catamaran trip and caught the ferry from Tahiti to Moorea. Linareva was on the west side of the island. We rented a car at the ferry location on the east side and off we went. 60kms (36 miles) is the distance around the island. We arrived at the resort and checked in. There are maybe 7 or 8 buildings which were mostly built for large groups and very nicely decorated and well-maintained. Our bungalow was for two people and had a kitchenette. The interior was clean with all that we needed which included a couple of resident geckos which didn't bother us. There was an honor bar with wine, beer, soda, and bottled water. We were told not to drink the tap water. We never bought any of the meals that the resort offered. There is one large grocery store on the island and many smaller markets. We cooked all our meals except one. Walked down the road to Daniel's pizza. It was excellent thin crust pizza freshly prepared in a wood-fired oven by a Frenchman. The grounds with grass, flowers, and fruit trees are kept neat and tidy. The snorkeling, kayaking, paddle boarding was most excellent. Bicycles are available too. All the equipment is provided without charge. You could exercise your choice for several miles if you wanted to. The reef around the island makes it possible. Dive equipment for rent and guides for hire are also on-site. The resort has a long jetty out to a drop off into the lagoon. Saw a 10 foot nurse shark, 3 black tip sharks, moray eel, octopus, sting rays, and colorful fish galore. The black tips were curious and would hang around the snorkelers. No one was frightened. The owner, Roland, was very friendly and made you feel welcomed and special. His staff was just as friendly. 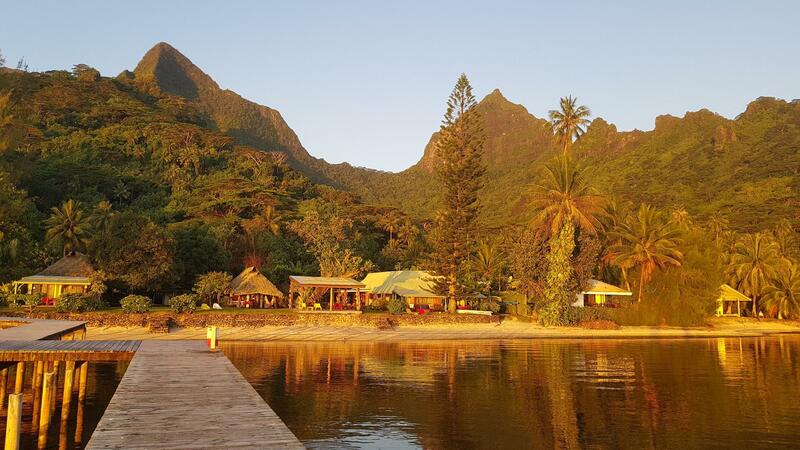 If we ever return to French Polynesia, we will spend all our time on Moorea at Linareva. 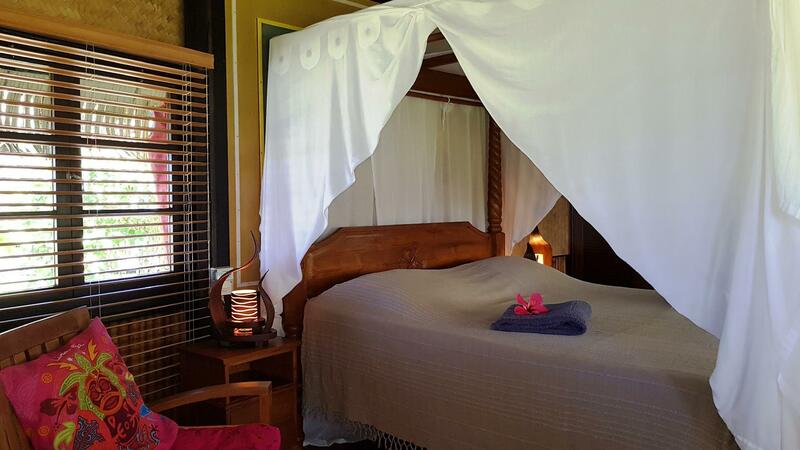 We highly recommend Linareva Moorea Beach Resort. It really is a great value for the money. excellent. i had a lovely one bedroom cottage on the beach with a fully stocked kitchen. free bike was convenient to go a few km away to the atm, a few local restaurants. it is a little bit off the beaten path which is great but makes going around without a car a bit challenging. Hébergement super, cadre super, accueil super, tranquillité super, le top quoi !!! hübsche anlage, hübsche bungalows, strand ist allerdings kaum vorhanden, ist etwas abgelegen, dafür sehr ruhig, nächste einkaufsmöglichkeit ca. 2 km entfernt, restaurants in der nähe gibts kaum, fahrräder werden vom hotel kostenlos gestellt, ebenso kajaks. internetzugang ist ebenfalls kostenlos. El hotel tiene playa propia aunq para nadar hay q meterse dde termina el muelle. Tiene kayak, bicis y snorkel gratis. Lisa y Melisa son muy buena onda y ayudan en todo lo necesario. Esta un poco lejos de las dos mejores playas pero se puede alquilar scooter por buen precio. 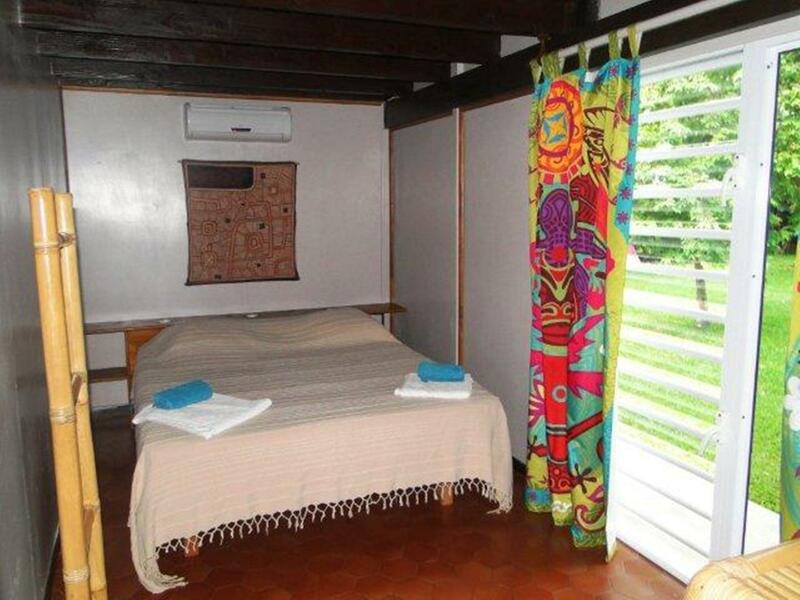 Si queres relajarte y desconectarte es un lugar muy recomendable. Saludos a mi amigo Bruno. Friendly staff, Magnificient scene, and very good place for snorkerling and its free. Linavera merupakan sebuah tempat yang saya amat mengagumkan selama 2 minggu cuti di negara Tahiti. Dari hari pertama, pemilik Lodge Linareva dah mengambil inisiatif untuk berkawan dengan kita dan memastikan keperluan dan keselesaan di sana. Interasi dengan memberikan kita banyak informasi tentang latar belakang dan activiti yang ada di kawasan ini, dan dia merupakan seorang yang lucu. Linareva kebaikan adalah mereka telah menyediakan sampan dan kayak dengan percuma untuk tetamu dan sesuai untuk snorkeling kerana ia menpunyai perbagai jenis ikan, gurita(sotong), ikan yu, dan Manta-Ray. Suasana di Linareva amat indah dan mengagumkan, tempat yang saya mengesyorkan mesti lawat semasa di Mo'orea Island, Tahiti.